A Royal Encounter for The Project Group in Oswestry! We would like to congratulate the Project Group on their recent Royal recognition! They have been awarded the Queen’s Award for Voluntary Service. Find out more about them on Facebook and the links on YouTube below. We provide a creative environment for individuals, in touch with mental health services, to achieve at their own pace. Most of our members are currently unemployed and use their time with The Project Group to become confident within a work like environment, gain new skills and motivation to become “work ready”. Innovation and quality are at the heart of our success. The ethos of the group encourages artistic experimentation and risk taking – whilst providing a framework for less confident members to move forward at their own pace. We work with professional artists, at all times, within a professional studio environment. The Project Group has 35 members and we foster a culture of achievement. Through this culture members gain in confidence and self esteem, showing motivation and commitment, achieving well above expectations. Members come from all over Shropshire. Members are involved in all aspects of group projects and management, taking up roles and responsibilities as well as paid opportunities. The Project Group (Oswestry) CIC is an arts based community business (not for profit) working largely on art commissions for the public and private sectors. 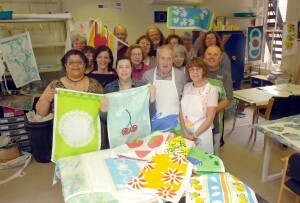 The group’s activities include community and public workshops, and a retail range. « A serene sky from Sue……….